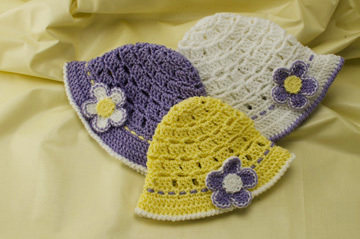 Our Baby Sun Hat comes in 3 sizes, perfect for newborns, babies and toddlers. It includes a pretty optional flower and some contrasting yarn at the top of the brim that can be adjusted as baby’s head grows! Use your favorite colors to customize this sun hat for those adorable babies in your life! The pattern includes written instructions for each of the 3 sizes, written separately, making it easier to follow the instructions for the particular size you’re making! There are extra photos of each hat size, as well as close up photos of the flower and trim. Also included in the pattern is a link to the online tutorial for working the contrasting edging on the petals of the flower. Crochet stitches used in this pattern: sl st, ch, sc, hdc, dc, tr, rev sc. Note: Photographed models made with Red Heart Baby Sheen in #570 Lilac, #1 White and #600 Sunshine.